Ever get frustrated in endlessly losing the end of the roll tape when taping up all your holiday packages, especially those you are trying to get ready to mail? Me too! Just try this little trick next time you are in mid wrapping and need an extra set of hands. 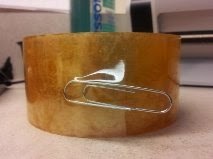 Stick a paper clip near the end of the tape, so part of the paper clip is sticking out from the end of the tape. You'll always know where the end is, and you won't have to keep trying to pry it up. umm perfect those are ALWAYS laying around! 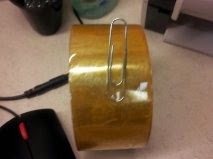 Yet another really clever use for a paper clip!